The New York City Department of Environmental Protection (DEP) on Tuesday joined Trout Unlimited and agriculture students from John Bowne High School to release juvenile trout that the students have raised in their classrooms since October of last year. Nearly 100 fingerlings were released into the Cross River on Tuesday where it passes through the Ward Pound Ridge Reservation in Westchester County. Cross River feeds into New York City’s Cross River Reservoir. Since 2002, DEP and Trout Unlimited, a national grassroots non-profit organization whose mission is to conserve, protect, and restore North America’s cold-water fisheries and their watersheds, have worked together to educate students in New York City and watershed communities about the importance of protecting our shared water resources through the Trout in the Classroom program. The conservation-oriented environmental education program teaches young New Yorkers, ranging from pre-K to grade 12, about the connections between trout, the New York City water supply system, water quality, and students from both sides of the water tunnel. This year, thousands of students from schools in New York City and the upstate watersheds incubated trout eggs in their classrooms and raised them into juvenile trout, which are also called fingerlings. 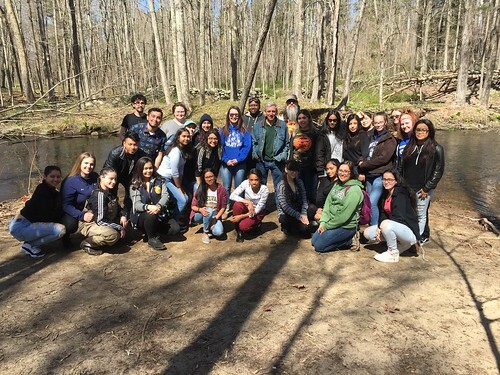 The 8-month long program culminates with students taking part in a field day, where they release the fingerlings into New York City watershed streams April through June.